Update 15 Feb 2015: visit the iodine video site here, with all the relevant videos and product links! Any one who knows me, realizes that means buying more books. So I bought a secondhand (I am still Dutch at heart sometimes) version of “iodine why you needed and why you can’t live without it,” second edition and devoured it. It became very clear to me that we needed to do the iodine loading test, as the expectations is that we will also be low on iodine. So I call my GP’s assistant, and ask whether we can do this test. It took about half an hour to find out that laboratories they use do not know anything about such tests or iodine deficiency. This was very disappointing. I will call the US company tonight to figure out where the day provide anything in Europe, or hopefully in Switzerland. Back to the book. After reading it, good reason to inform my GP about it more detail through an email. His wife is a gynecologist and if she doesn’t know about this she really misses something in treating women. So I ordered David Brownstein’s fifth edition, which came out in 2014, , with three new chapters, including references to diets which is exactly what I need for the book I am working on. It arrived with a book by Lynne Farrow, “The iodine crisis, what you don’t know about iodine can wreck your life,” from 2013. 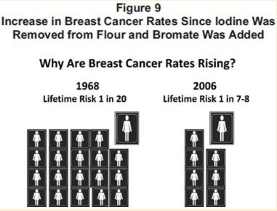 Lynne actually had breast cancer yourself, and as a journalist dug deeper and found why many women are being diagnosed with cancer while iodine deficiency may be the big missing link. She started supplementing with iodine and immediately felt better and had many positive health benefits. Eventually she found it a nonprofit organization called breast cancer choices which specializes in scrutinizing available information about breast cancer. There are countless compelling stories of people’s experiences. One chapter is about the timeline of knowledge about iodine, which starts 15000 years B.C. till 2012, with the founding of iodineresearch.com. She asks: what is going on? What can explain the rise in breast cancer? Without an essential amount of iodine, the breasts and ovaries seem to get congested and swell. Cell membranes do not work, toxic fluids back up, causing inflammation, enlargement, nodules start growing. Lynne explains the bromine poisoning which attaches to the iodine receptors, pushing out iodine, its halogen sister. Bromine is found in bread (replacing iodine since the 1958, approved by the FDA), in fire retardants, toilet cleaners and many other things you encounter on a daily basis, and is persistent, which means it can build up over time and stay in the body – disabling iodine from doing its work. As David Browstein documents – Chlorine and the other halogen sister of the periodic table, fluoride, does the same. Chlorine from perchlorate in rocket fuel, which poisoned most of the Colorado river irrigation areas, fluoride from dental applications. In fact, some diets may cause iodine deficiency. You may use iodized salt? Studies done in 1969 show that iodine in refined salt is only 10% bioavailable; and after opening the package, the iodine evaporates out in about 4 weeks. So think again. The good news – by taking iodine in the right doses, the bromine can be displaced; using salt in water solutions helps that process along even more, as David Brownstein also describes in his book**. So both books are a compelling read and cause to take action now. 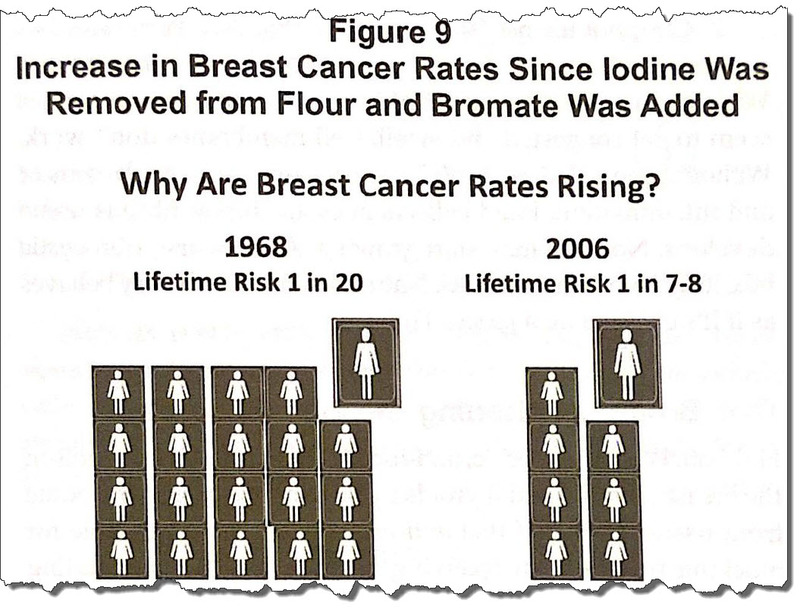 Regrettably, most doctors are not up-to-date about this iodine story. Lynne’s book has a large list of resources to help you get smart about this slowly developing problem. And beware – you know the Kahuna motto – if you do not pay attention, you pay with the pain of getting a possible maiming, because of, as Lynne calls it, “consensus, not evidence based” medical treatment. I will keep you posted about the iodine loading test progress. *Farrow, Lynne (2013-04-01). The Iodine Crisis: What You Don’t Know About Iodine Can Wreck Your Life (S.36-37). Devon Press. Kindle-Version. **Brownstein, David. Iodine: Why You Need It, Why You Can’t Live Without it. 5th Edition edition. West Bloomfield, Mich: David Brownstein, M.D., 2014.